February 18, 2018 — Come one, come all! Grab a cup of coffee and join Automatticians Konstantin Obenland and Michael Cain for a morning show-style WordCamp talk that’s buckets o’fun for anyone and everyone. We’ll break the session into three segments: news from around the WordPress world; a special guest interview with a WordPress “celebrity”; and a “shop talk” segment about a design or development topic that we’re hoping to learn more about by pretending to be experts in front of you, our audience. There will be laughter (hopefully? ), there will be tears (regrettably? ), there will even be some awkward silences (definitely). But most importantly, there will be plenty of that whole-grained, balanced-diet WordPress that you just can’t get enough of. March 31, 2017 — Come one, come all! 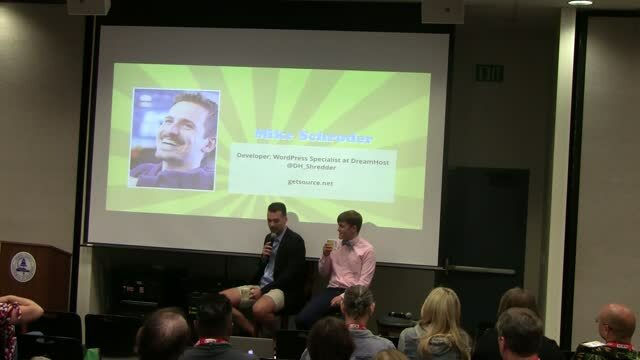 Grab a cup of coffee and join Automatticians Konstantin Obenland and Michael Cain for a morning show-style WordCamp talk that’s buckets o’fun for anyone and everyone. We’ll break the session into three segments: news from around the WordPress world; a special guest interview with a WordPress “celebrity”; and a “shop talk” segment about a design or development topic that we’re hoping to learn more about by pretending to be experts in front of you, our audience. 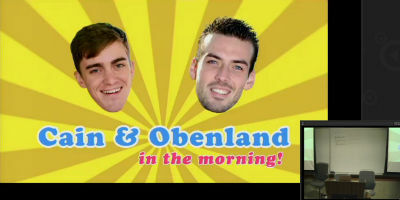 August 2, 2016 — Cain & Obenland in the Morning! 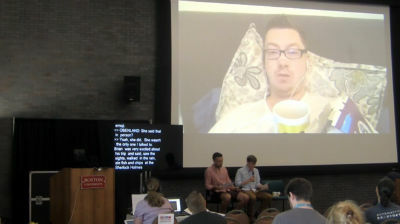 is a morning talk show-style WordCamp session aimed to kick-off WordCamps with interesting, current, and informative WordPress topics… and a little bit of lighthearted fun. Our sessions are broken into three parts: The WordPress Not-Nightly News (news and current events from around the community); a special guest interview (a Q&A introduction to a bigger name attendee/speaker – what do you do?/how’d you get started?/etc. ); a current, introductory-intermediate design or development topic (i.e. internationalization, security best practices, theming, etc.). 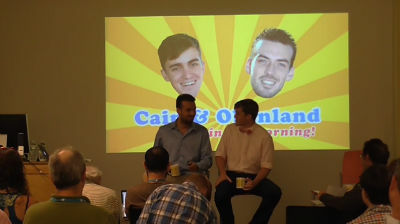 May 11, 2015 — Cain & Obenland in the morning! 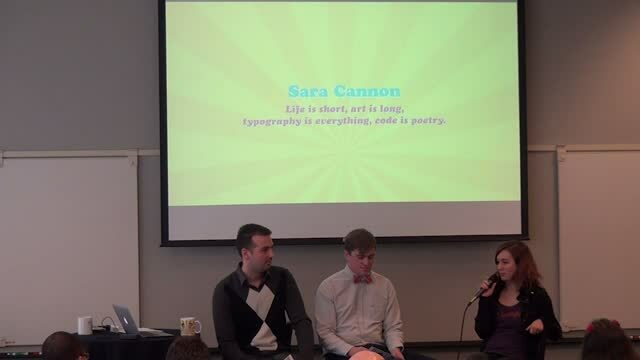 – a morning show-style WordCamp talk with three segments: two that will cover any number of WordPress topics – current WP happenings, theming, design, development, best practices, worst practices, future trends, you name it – and a special guest interview with a big name from the WordPress world. 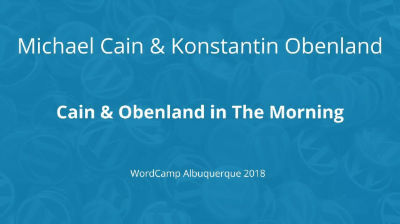 October 13, 2014 — Grab a cup of coffee and start your day off (no matter what time it is) on the right foot with Automatticians Konstantin Obenland and Michael Cain in our morning show-style WordCamp talk! 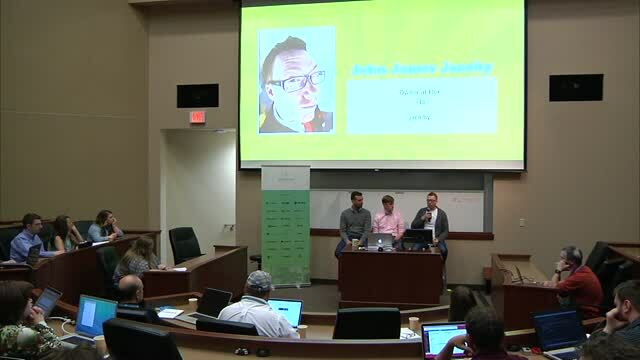 June 9, 2014 — Grab a cup of coffee and start your day off (no matter what time it is) on the right foot with Automatticians Konstantin Obenland and Michael Cain in our morning show-style WordCamp talk! We’ll break the session into three segments, two that will cover any number of WordPress topics – theming, design, development, best practices, worst practices, future trends, you name it – and a special guest interview with a big name from the WordPress world. There will be laughter (hopefully? ), there will be tears (regrettably? ), there will even be some awkward silences (definitely). But most importantly, there will be plenty of that whole-grained, balanced-diet WordPress that you just can’t get enough of. May 11, 2014 — Join Konstantin Obenland and Michael Cain for a whimsical trip down Advanced Theming Lane, where they’ll shed light on some of the dastardly mishaps in Themeland and how they fight them with their Swords of Best Practices. Structured like a TV morning show!